The holiday of Sukkot commands Jews to live in “booths” — commemorating the temporary dwellings their ancestors inhabited while wandering the desert for 40 years. Though many Manhattan apartments measure only slightly larger than those original booths, unless the apartment roof is retrofitted with twigs from Central Park, it doesn’t quite qualify as a sukkah. Thankfully, one Chabad Lubavitch yeshiva student in Brooklyn has taken it upon himself to ensure that all New Yorkers can experience the holiday. Levi Duchman, 21, is the inventor of the pedi-sukkah, a rickshaw bicycle with a mobile sukkah attached to the back. While small, each sukkah meets all the halachic requirements. 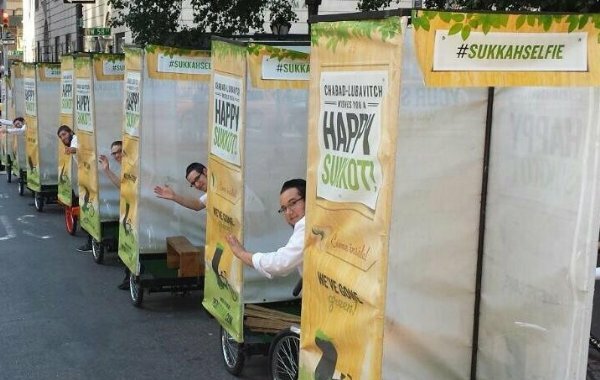 During the days before Sukkot and during Chol HaMoed, Duchman says he spends 12 hours a day on the pedi-sukkah, pedaling around Brooklyn and Manhattan to let New Yorkers step inside to say a blessing. Sometimes people ask to take a ride in the sukkah, and he obliges for short trips. Duchman built his first pedi-sukkah five years ago. He rented a pedicab and worked overnight with his younger brother to create something that hopefully wouldn’t fall off and block Manhattan traffic. The sukkah stayed put, and today there are over 50 of his bikes spread across 15 states and over five countries. The bikes have come a long way. Duchman now works with a manufacturer to create an easy-to-assemble pedi-sukkah. He even created a “menorah cycle” for Chanukah, and a “mitzvah cycle” affixed with a banner that encourages others to lay tefillin and light Shabbat candles (because it’s never a bad time to ride a bike and do good deeds). Between the cost of the materials and the pedicab itself, one bike goes for nearly $2,000. But Duchman charges exactly what it costs him.